Enjoy our Tokoroten’s original taste and flavour that has remained the same and has never changed since 1869. The Izu peninsula is the origin of best algae you can find. 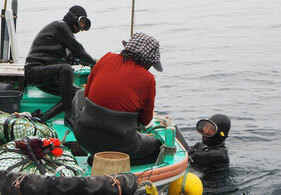 We use plenty of high-quality algae hand-picked by Ama (woman divers) from Izu-inatori. 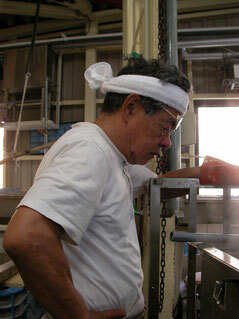 Algae is the raw material of Tokoroten. It becomes a jelly-like texture when it is stewed and cooled down. In the early days of the Kamakura era, people used this method from China to make “tokoroten” for people to enjoy at the market in Kyoto. Water is the most important ingredient for Tokoroten. 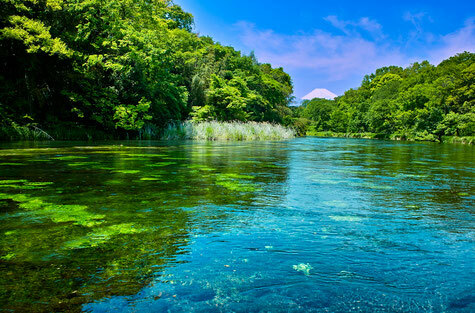 Our company sources it’s water from『Kakita-river spring water』which is one of “ Japan’s 100 most remarkable waters”.Kakita-river is groundwater from Mt. Fuji and the amount of water is the best in Asia. We reached own remarkable and unique manufacturing technique after many years of research since 1869. We use these algae and blend them to create the perfect texture of our Tokoroten. The algae is slowly stewed for hours with Kakita-river spring water. It is then strained 3 times, poured into a metal cooling pan and finally, cooled slowly at room temperature. putting in our utmost effort to retain it’s reputation.